As we head into March, even with the mild winter we’ve had, dog owners are looking forward to spending more time outside with their pets. If you go to a park or on a hiking trail or even around the house, there are plenty of potential problems out there for dogs, especially given their curious nature. But if you are prepared you can prevent some of these things from becoming a major problem for you and your pet. I’m going to list some of the basic things you need for your first aid kit. This will fit easily in a fanny pack and many of these items can be used by you and other humans should the need arise on your hikes. Cat owners you too should have a kit ready as well. Pet Tech offers pet first aid classes and can explain how some of these ingredients are used. The American Red Cross also offers pet first aid classes. You can ask your vet about this as well. In addition to these items you should keep a picture of you and your pet together in the bag in case you need to prove ownership of the dog. Also you may have emergency numbers in your phone, but you should have them written down too. Your cell phone batteries could be dead and you may have to borrow someone’s phone. Also include a number for poison control. 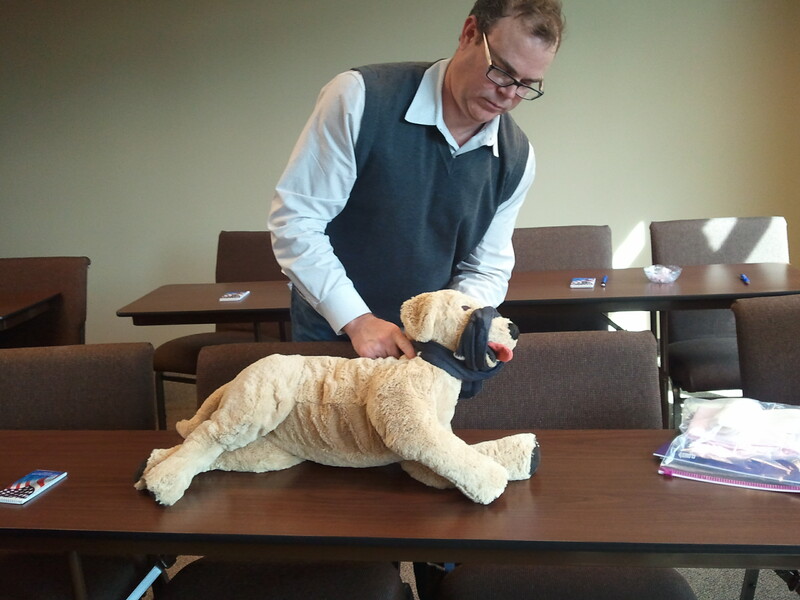 Last week I took a pet first aid and CPR class through the GNPP. I took the class last year, but wanted a refresher course. First aid for humans and pets is something everyone should know, but hopefully will never use. I was a Boy Scout growing up and had a lot of first aid training from that. I was a lifeguard and had senior lifesaving, plus I was certified in CPR. The class was taught by one of the GNPP members who is a Pet Tech instructor. At the Pet Tech site you can get information for the smart phone app they have. There is a fee for the app. The American Red Cross also has pet first aid classes in the Atlanta area. Many of the basic principals in first aid are the same for pets and humans. The thing that I liked best about the class is that it addressed a wide range of situations you may find yourself in with a pet and it increases your awareness of situations and things you can do in your pet’s environment to eliminate potentially hazardous situations. It’s important for you to remain calm. When your pet senses your panic, it will panic too. Talk to it in the same calming voice you usually use. Cat owners probably already know this, but cats are very good at hiding their injuries. This comes from their natural instinct, not to show weakness because you may lose your order in the group. A 10 pound cat is equal to a 50 pound dog. Cats are also more difficult to muzzle and restrain than dogs are because of the shape of their faces. Dog owners need to have a piece of cloth handy to be used as a muzzle. It should be at least 6 feet long and about an inch wide. The belt of an old robe may work. Felt is a good material because it has a little natural stretch in it. You do want to muzzle a pet in pain, a pet you are about to move into pain, or a pet that is alert enough to bite. You don’t want to muzzle a pet it’s vomiting, having a seizure or having problems breathing. You also don’t want to muzzle a dog that’s having trouble breathing or one you will have to leave unattended. This link shows it much better than how I would explain it here. Scroll down a bit for it. I’ll have some more information about some things to have in a first aid kit for your pets later this week. You can always find information about pets, pet events and how we can take care of your dog walking or pet sitting needs at my Fetch! Pet Care website.